OK, as I understood it, the AP Index was supposed to be about as low as it could go at the 2 to 3 range. Now we hit ONE? With a sun activity index like this, as close to zero as that, I have to wonder: Is it time to worry about a little ice age yet? 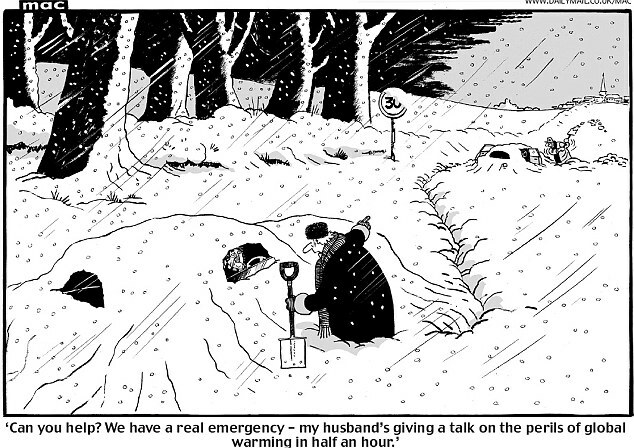 Original image from this UK Daily Mail article about the impacts of snow in the U.K.
And when people start to turn, it shows up first in humor, as in the cartoon above. Greetings from a very cold UK-this is the most extended period of cold weather since 1981 so I enjoyed the cartoon! I am looking at the location of various weather stations to try to determine where they are now, where they USED to be and what, if any, UHI factor is included. First up is Plymouth UK- I think it used to be at Mount Batten-a former weather station in a remote location on the coast. Great site for a weather station. However it closed around 10 years ago and there now appear to be four candidates, all of them much closer to the expanding city. Second up is Bologna Italy -photo below of what I believe to be the official weather station location-at an airport. Are you able to confirm the location of the official sites, plus history/UHI factor? I remember Leif Svalgaard pointing out that solar data needs to be adjusted for the eccentricity of the earth’s orbit and you can’t compare adjusted to unadjusted values. IOW, you would need to make sure you are comparing apples to apples before speculating on the significance of the AP index. # Prepared by the U.S. Dept. of Commerce, NOAA, Space Weather Prediction Center (SWPC). # Source Ap for final month is Estimated Ap: USAF, AFWA, Offutt AFB, Nebraska. # Values for most recent 6 months are considered preliminary. Anyway, thanks for awakening me to yet another fine resource. Hey E.M. Smith. I just read your extended comment comparing economics to climate, and I loved it. I’ve studied economics, and while I am no trader, you still did a good job at making the ablexxive understandable. Thanks for your comment; it was very, very good. I was wondering if you would be so kind as to take this opportunity to explain to me a little bit about what the AP-Index is and what your graph means. I have a pretty good grasp of sun spots and solar flux, but I don’t really understand what the AP-Index means as I haven’t come across a good, succinct explanation anywhere. using the TSI index as a proxy, we are at the closest point in our yearly orbit. Why isnt this front page news! Aaaah the MSM has a lot of explaining to do! Squidly: I was wondering if you would be so kind as to take this opportunity to explain to me a little bit about what the AP-Index is and what your graph means. I have a pretty good grasp of sun spots and solar flux, but I don’t really understand what the AP-Index means as I haven’t come across a good, succinct explanation anywhere. Well, I’ll do what I can. Don’t expect this to be an exactly correct explanation, but do expect it to have the basic idea right. And they gave them alphabet soup names like “K” and “A” and the sons and daughters of A: “Aa” and “Ap”. K indices isolate solar particle effects on the earth’s magnetic field; over a 3-hour period, they classify into disturbance levels the range of variation of the more unsettled horizontal field component. Or how much that “stuff” whacks and wobbles our magnetic field over a 3 hour period. the average of the eight 3-hourly a indices. Ap index: An averaged planetary A index based on data from a set of specific Kp stations. So A and Ap are still measures of how much our magnetic field is being bounced arround by the sun, but with the numbers scaled to a bigger value, and with Ap being from a specified set of measuring stations. Bottom line: An active sun wobbles our mag field around a lot, while a quite sun wobbles it very little. And right now we’re headed for near nothing. The Sun is being Very Very quiet, and very inactive. OK. Pretty clear. Low Ap means quiet sun and we might see some cooling effects. This Ap index is a proxy that tells us that the sun is now quite inactive, and the other indices of sunspot index and 10.7 radio flux also confirm this. The sun is in a full blown funk, and your guess is as good as mine as to when it might pull out of it. So far, predictions by NOAA’s SWPC and NASA’s Hathway have not been near the reality that is being measured. The starting gate for solar cycle 24 opened ayear ago today, when I announced the first ever cycle 24 sunspot. However in the year since, it has become increasingly clear that the horse hasn’t left the gate, and may very well be lame. So at the end of all this, what does it “mean”? That the sun is in a slow dull state, does not show signs of waking up, ought to stay that way for about another decade, and that we have every chance of entering a “grand minimum’ such as the Maunder or Dalton. The Dalton minimum had “1800 and Froze to Death” or “the year without a summer” when New England had snow in Summer after a big volcano let loose in 1816 (IIRC) or so. So we are “1 volcano away” from a major disaster in terms of crops and food. So if we are very lucky, it means we will learn something about the sun and past solar / volcanic relationships will be broken showing it to be an accident of statistics. And if we are unlucky we get snow in July and not much to eat. And in both cases “we live in interesting times”. So does that do it for you? You articulate well, it takes an educated lay person to make something clear to another lay person, less well read. Leif S wrote a fairly long comment on Anthonys blog on this, well beyond my ability to grasp. My question is what did you get out of his comment. 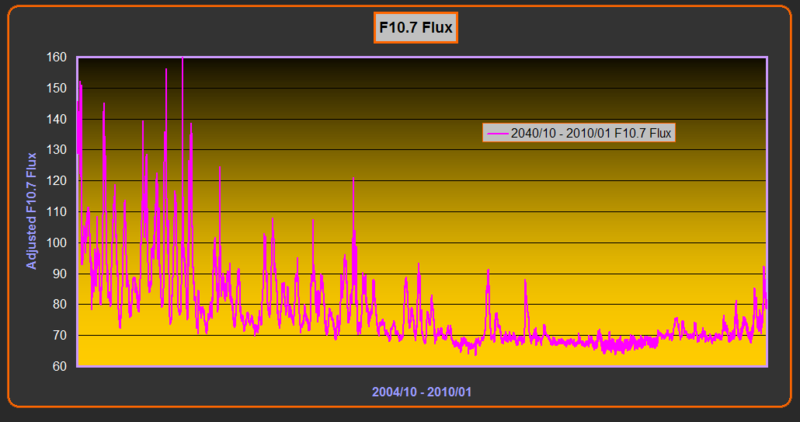 I did some plotting of the adjusted F10.7 flux today and noticed the same “step change” that the Ap index displays around 2005. (For those unfamiliar with it, the Sun also puts out radio signals. The F10.7 measures one of those frequencies and looks for how strong it is as an indicator of how much ‘other stuff’ is being made by the sun too. Ham Radio (Amature Radio) operators in particular watch it because it determins how far away they can hear and be heard (how much “skip”).